We’re flocked with snow again after yesterday’s snow. It’s so beautiful! We just got another beautiful Minnesota snowfall. Looks like close to 8 inches at our house and once again the trees are flocked and roads are snow-covered. Lots of people around town were disgusted by the snow since it had gotten so warm last week. However, I see the snow as a sign of the coming spring! March snow is as much a part of the summer cycle as the first sunburn on pasty white skin. Not as painful, of course, but part of if just the same. Even last year during our no-snow winter we got a March storm big enough to go snowmobiling. So I say “Bring it on, Mother Nature!” Get it on and get it over with so people can come North! Even our water toys get a rest in the summer. 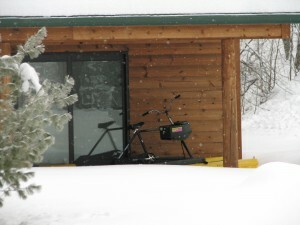 Our hydrobikes are sheltered while they wait for open water! Jay and I have a spring vacation planned. We are looking forward to getting a rest and spending quality family time! We haven’t always planned a spring vacation. In fact, for most of our 14 years at Wildwood we haven’t taken any vacation at all. But last year we called a halt to that crazy behavior because we all need a timeout. First of all, we need something to look forward to. Nothing is more depressing than facing another year of nose-to-the-grindstone months. We planned our coming vacation in December and we have been talking about it and dreaming of it ever since. I’m not even dreading the coming summer season where we work from May to October without a day off. I KNOW that when we return to real life after our vacation that I’m going to be ready to spring clean those cabins. Taking a Life Timeout does that for a person. I read something in a book once that I’ve quoted many times over: we pour ourselves out into others but if we never refill our own pitchers then we have nothing left to give. I think that’s what a family vacation does for a body. We’re so tied to our devices and our schedules that it almost feels like the sky will fall if we aren’t plugging away in our little corner of life all the time. However, I know for a fact that isn’t true! We CAN shut off our phones and leave the house or leave the country and just enjoy our kids and our spouses. These could be your kids having fun on vacation! We can unplug and unwind and the sky won’t fall, Chicken Little! So that’s our plan: unplug, unwind and rest. 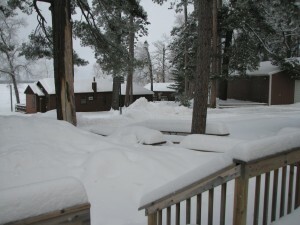 And when we get back from our Life Timeout we’re going to be ready to work hard to get the resort ready to welcome you! Because this summer is your time to unplug, unwind and rest. 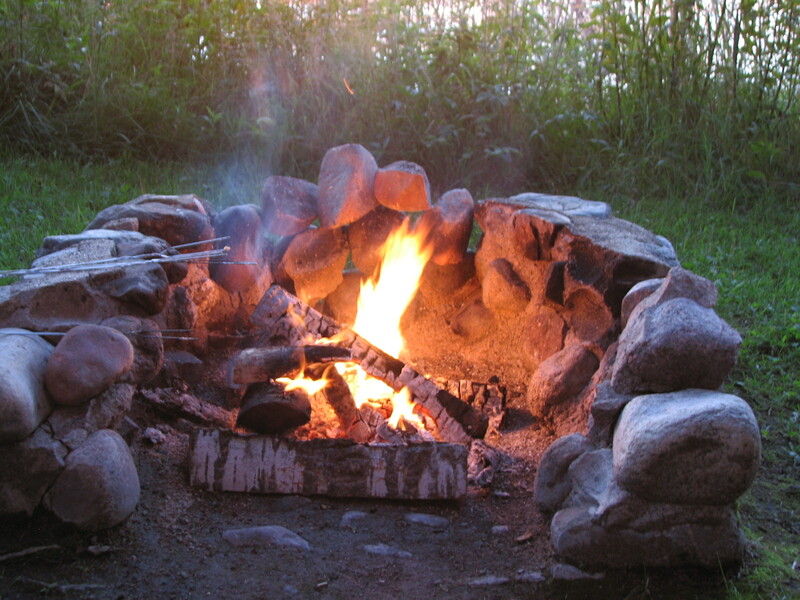 Do some fishing, lay on our beach and eat s’mores by a fire while you watch the sun set over Bass Lake. Ah….doesn’t that sound like something to look forward to? Won’t that refill your pitcher?! You don’t have to stay at Wildwood Resort this summer…there are LOTS of Minnesota family resorts that are amazing and fun and relaxing. Just pick one. Do something for your family today. Do something that doesn’t involve running kids around town or planning supper! 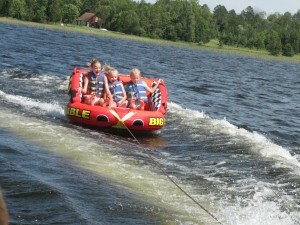 Plan a stay at a family resort in Minnesota and get ready for fun. The snow can’t last forever but memories last a lifetime. Can’t you smell it?! Bring on the marshmellows! Fishing on Bass Lake has been pretty darn slow this last week. We had guests in last weekend who really had to work for their fresh fish supper! 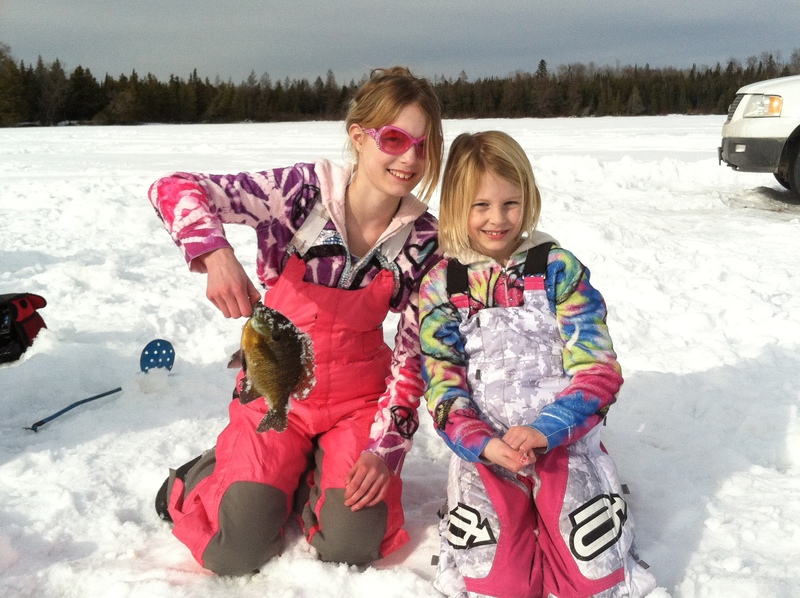 The girls and I had never gone ice fishing so on Sunday we decided to find out for ourselves whether or not the fish were biting. Guess what!? They weren’t! However, it was a GORGEOUS 30 degrees and partly sunny so I didn’t care that we didn’t catch fish. It was relaxing just sitting there on our 5 gallon buckets talking with friends and watching the Vexlar. It was amazing to me that it was just as relaxing as sitting in a boat fishing on open water. I was wishing we’d driven a truck out to the spot so I could crawl in the back and take a little snooze. (That’s what I usually do when we fish in the summer!) Ice fishing in Minnesota is a cool experience. There was a sense of commradery out there that I didn’t expect. In the summer you’ll hear fishermen growl when another boat comes too close and drops anchor to fish. It’s a breach of fishing etiquette to encroach on another boat’s personal space while fishing on open water. However, on the ice it seemed that there were no rules about how close you were to other fishermen. 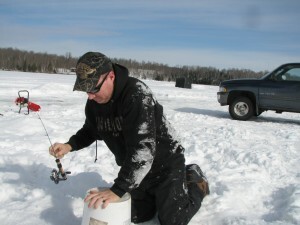 People would just drive up to the spot and start punching holes with their ice augers. 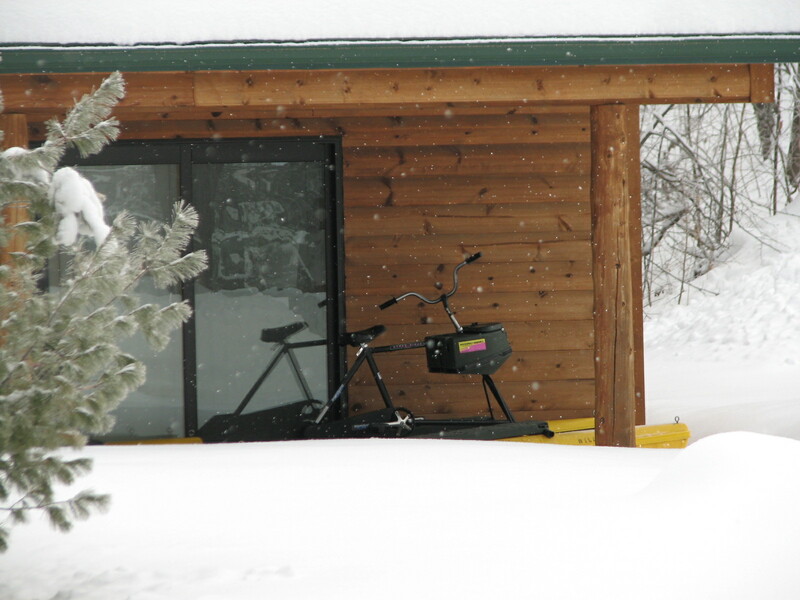 (Assuming they were able to start their ice augers…our friend, Bob, couldn’t get his running!) One couple pulled up in their pickup and the husband got out, punched a hole right outside the passenger door of the truck and his wife sat in the truck and just fished from her seat. She didn’t even get out of the truck! That cracked me up!! I bet when she got nice and relaxed she just layed back on the seat of their truck an snoozed in the weak winter sun. We had a blast even if we didn’t catch a fish. Now Jay is scouring Craig’s List for an ice auger, a portable ice shack and a Vexlar. Jay had some trouble sticking on his seat so he spent some time rolling around in the snow! Thank God he found something new to search for! He bought a plow truck in January and without plow trucks to obsess over he’s been a little lost. Search on, dear husband. I need a portable shack conducive to catnaps out on the ice! 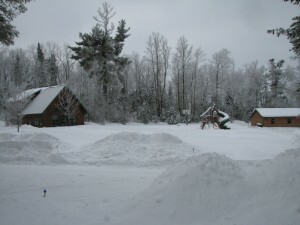 In late February we took a weekend off and went to the North Shore for a snowmobile weekend. We had a blast! I was surprised that the trails on the north shore where we were looked very much like the trails around Itasca County. The trails we rode were all be inland and for some reason I had expected to be riding more along Lake Superior so we could enjoy the view. However, that sounds like criticism and I don’t mean it that way. We had a wonderful time and visited very cool places like The Trestle Inn and Gooseberry Falls. We stayed at the very wonderful Cove Point Lodge in Beaver Bay, MN and ate great food at places like The Rustic Inn just north of Two Harbors. 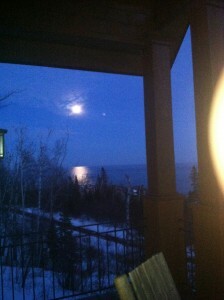 (The homemade pie at The Rustic Inn is worth a trip to the North Shore all by itself!!) 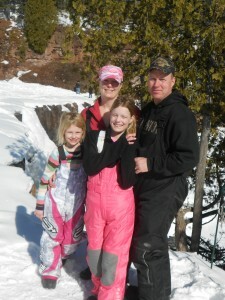 We rode, laughed, ate too much and generally got to enjoy what our guests enjoy when staying at Wildwood for their Minnesota snowmobile weekends. I’d never seen Gooseberry Falls before. We were literally standing on the falls which was so cool. We even saw some crazy guy climbing the ice flow. Crazy but cool! Soon it our time for recreation will come to an end so we’re busy planning our spring projects and purchases and that always makes us excited for another season. It will be here before we know it! 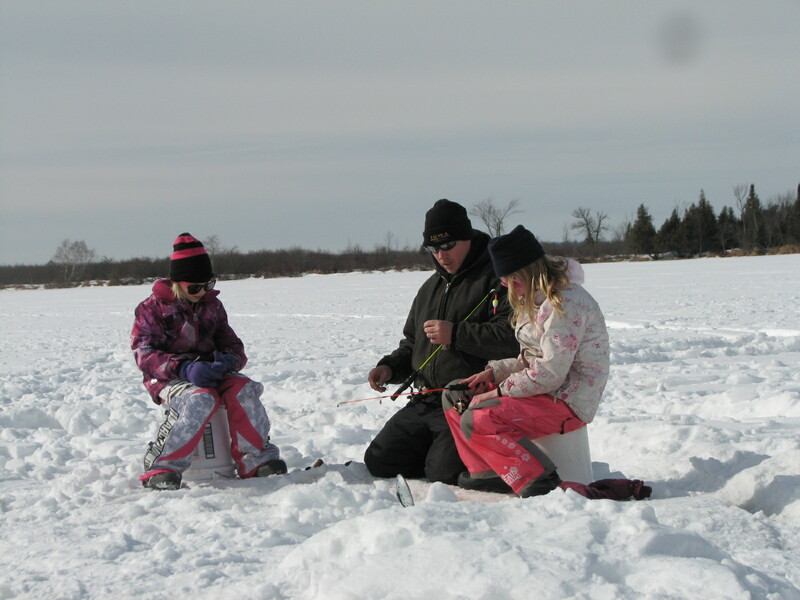 Enjoy this last little taste of winter and if you haven’t done so already, plan a little family time for the coming summer. Even Chicken Little learned that the sky won’t fall and he was, well….a chicken! P.S. Do you follow us on Facebook? Like Wildwood Resort on Facebook and you’ll have the chance to see lots of photos and sometimes a few videos of life at Wildwood Resort! 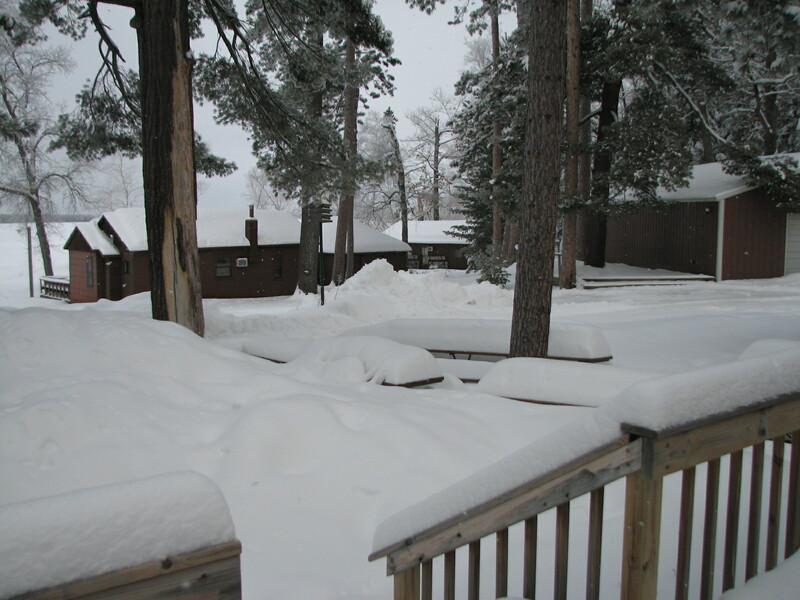 The picnic tables are kinda buried right now! But in a few short months they’ll be back in action for our weekly potlucks.